London has gone burger mad, and sadly, I have not. I LIKE burgers, however, I do not LOVE them. I often felt a little bit of a weirdo as all my burger hound friends around me regale at how their last burger was perfectly medium rare, how the cheese melted perfectly coating their exceptionally balanced patty like a snug yellow blanket. I wasn't always like this, I just think I have reached my fill for now. Living so close to the Meatwagon (in all it's incarnations) for such a long time has probably spoiled my immediate desire for "proper" burgers, a serious case of "too much of a good thing". There have been a few recent run-ins which have worked towards semi lifting me out of this burger funk, one of which can be attributed to the diminutive 3oz steamed beef patty at newly opened Mishkin's. It may be small, but packs a deeply beefy punch, smothered in a delicate coating of cheese (Swiss) and sat atop the onions they were steamed on. Add a perfect little bun and you get a perfect little burger. The rest of Mishkin's ain't too shabby either. 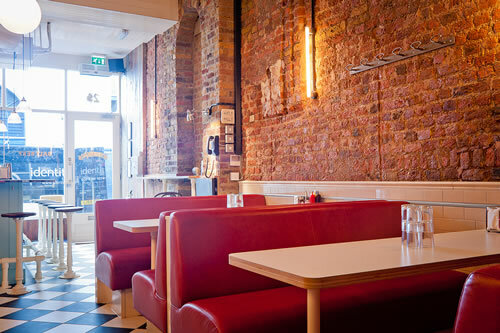 Loosely based around a Jewish American diner, you can get a variety of dishes inspired by Jewish favourites (such as the matzoh ball soup and salt beef sandwiches). As with all Russell Norman led projects (he of Polpo and Spuntino fame), the focus is very much around the casual diner, a space which is alive with atmosphere, and plentiful with booze. 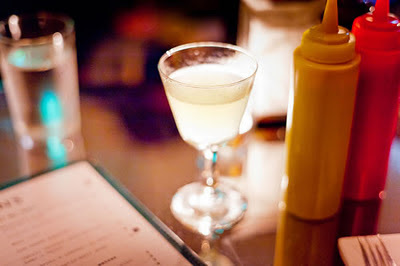 The formula is straightforward, bar at the front, seating space out the back, good food throughout. Mishkin's definitely feels a little more spacious than any of the Polpos. Sat in a big booth on my first visit, and in the rather cute little radio box on my second, it never felt crowded or over noisy. Other must orders for me include the Reuben and the meatloaf. The Reuben is quite a beast of a sandwich. Stuffed with mounds of pastrami, sauerkraut and swiss cheese, with a smear of the in house Russian dressing, the whole experience is enjoyable from first bite to last. When I think of meatloaf, I normally think of a huge hunk of ground meat in the shape of a loaf of bread, almost akin to a very dark loaf of rye. Not really the most appetising sounding meal is it? Mind you, my school canteen was certainly no Mishkin's, and the version here is a much more delicate affair. Slicing into the moist spiced meatloaf in a tiny bread tin yields the reward of a perfectly soft boiled egg. More like a meat-scotch-egg-loaf. Whatever it is, each rich mouthful is normally followed by an approving gurgle. I guess it's no surprise that I enjoyed Mishkin's. A lot. It might even be my new favourite of the Norman empire. The big bar (serving a number of gin based drinks) lends itself more towards a comfortable casual drink, or even the solo diner (I am one), and the vibrant restaurant space past the bar where you can lounge in the comfortable banquettes whilst enjoying your meal. Round off your meal with a bowl of bananas foster (caramelised bananas with a dash of rum and vanilla ice cream) and go home happy. I know I did. The Meatloaf was awesome, but my personal favourite was the smoked eel, latkes and apple sauce, really very good! Looking forward to going back for more! Every time i read your blog it makes me wish I lived closer to London! I like a good burger as much as the next person but seeking out something special like this for me is much more worthwhile. @ Dinnerathon - I had the smoked eels on my second visit and was a little put off by how cold the eel was, as well as not getting the latkes I was expecting (a big old fried potato cake instead of potato pieces. It's at the top of my to-do list: eat at Mishkins! ;) Great photography! 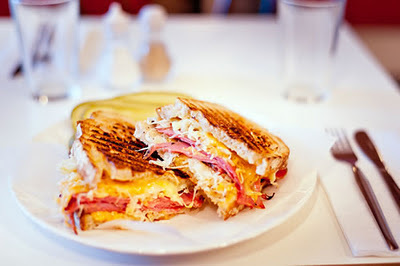 Two wafer-thin slices of meat – and you're calling this a Reuben. It's more sauerkraut than meat. And it's more bread than anything else. I've never seen such a stingy sandwich, let alone a Reuben. What a let down... I will never return again. @ Mondomulia - The photography is all the work of Mr Paul Winch-Furness! @ Joey - The portions I have had have always been pretty generous every time I have been. Definitely not NY portions, but I do find that a lot goes to waste out there. Sad that you were let down, but I certainly think it is worth a visit. I'm a big fan of a good Reuben. A good Reuben is a celebration of Life. It should be satisfying. And it should be generous. I will go miles out of my way for good Reuben or a good Salt Beef Sandwich on Rye with English mustard. These two sandwiches are like two brothers. I love them equally. 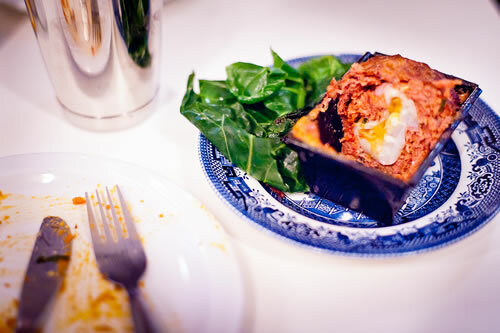 Two of the best places in London to get them are B&K Salt Beef Bar up in Edgware and the Beigel Bake on Brick Lane which is open 24 hours a day seven days a week. Both of these joints know how to make a super-juicy-fall-out-the-sides generous sandwich. You could put either one of these shops somewhere in Brooklyn, and they would still have massive ques. Because New Yorkers don't want fancy-pants nonsense. They just want a good sandwich. And if you go to B&K Salt Beef Bar up in North London or the Beigel Bake on Brick Lane out in East London – that's what you get. A no-nonsense great tasting super-juicy super-generous Salt Beef Sandwich. @ Joey - That is indeed some endorsement! I have been down to Beigel bake a few times before but had not heard of B&K before. If I head near Edgware, I'll make sure I check it out!